A cold december winter, some hot chocolate and and breakfast in bed. As I curl up inside my warm cozy blanket and pull my laptop a little closer to re-watch few of my Disney favourites. “Tomorrowland” has always been in my top ten. This sci-fi mystery adventure so beautifully captured my childhood imaginary world. This movie explores the how all the geniuses who had a future vision of the world were gathered to create the inventor’s paradise- The Tomorrowland. It reveals the journey of the protagonist ‘Casey Newton’ as she embarks on an adventure to find this place. She is in no way the descendant of the person who created too many laws just because an apple fell. Pun totally intended. Anyway back to the story, she meets a futuristic robot and a genius scientist, who was cast away from tomorrowland. Together they venture out to solve the mysteries that tomorrowland holds. This is where it gets interesting. So the genius scientist called ‘Fran Walker’ played by George Clooney, invents a device that allows the calculation of future. Hence, the device is like a countdown timer for doomsday. But that all completely changes as they realise this device was leading to a phenomenon known as “ Self-fulfilling Prophecy” and the doomsday was result of that. The rest I am sure you will know when you watch the movie. So, what is the Self-fulfilling prophecy? 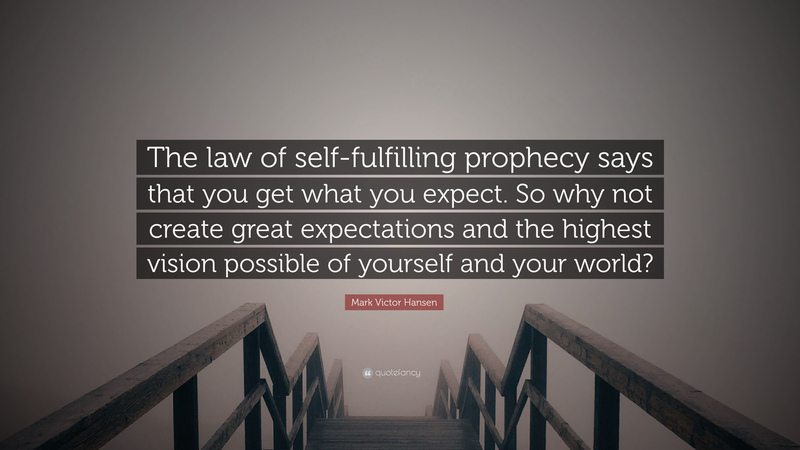 Psychology explains, self-fulfilling prophecy are effects in behavioral confirmation effect, in which behavior, influenced by expectations, causes those expectations to come true. It is complementary to the self-defeating prophecy. This wasn’t my first encounter with the word. I have come across too many quotes that revolve around this particular theme. What captured my interest was, how this phenomenon was not only a part of a bigger ripple effect in multiple systems but also how media played a large part in shaping this effect. Media, what part does it play? Arjun Appadurai in his article Disjuncture and Difference in the Global Cultural Economy, explores the various dimensions that have an impact on the global cultural economy and one of the fundamental elements being Media. It is interesting how Media is capable creating different realities for different people based of the kind of media they are exposed to. It is capable of stitching together pieces of realities in a complex way so as to invent a completely different reality. Thus, creating an environment that grooms human believes in a very distorted way into an assumed reality. To explain this is more simpler terms. Media creates narratives which are deviant from the truth. These previously distorted narratives are acknowledged by people and infused with their belief systems and perspectives. The final emergent distorted narratives as ingrained in people’s beliefs and expectations, thus leading them to take action. These actions lead to materialization of these futures. Consequently, inventing a completely new future/reality  Thus Media influences this ripple effect which leads up to the phenomenon we are referring to as the “Self- fulfilling prophecy”. Since the beginning of time, media has played a crucial role in global political and economical revolutions. With the invention of printing press going up to televisions and finally now the internet, the form has certainly changed over the years which has led to in exponential increase in the capacity of the media to influence people. The 2016 US elections: The media created a hype around certain elements and how disastrous it would be. That led people anticipating unfavourable results and hence leaving them uninspired to actively participate. Thus, resulting to the final decision. The gay rights movement in India: With the access of internet as total acceptances movements and gay marriage legalization in other countries spread. The belief system in India evolved to accept a cultural change which was previously considered a crime. The Canadian Migration: As the media harps on the glory of Canada as a country of opportunities and its welcoming policies for immigrants. It is slowly gaining power as the intellectual cream of various countries are migrating to this new land. Indian gaining global power: As the Media highlights the various international connections acquired by the Prime Minister. Increasingly youth in India are staying back and investing in start-ups etc. Thus, actually making changes that allows for it to be at an economical advantage on many fronts like technology, industrial development etc. Recent emphasis of Natural Beauty: Many brands are becoming more sensitive to inclusivity of various race in terms of their advertisement. That is inspiring a cultural change in the society to be more inclusive of different individuals. Feminist Moments: As empowerment of women can to the forefront and many influential figures and garnered their support. The professional world has seen a drastic improvement in women taking up more leadership roles. The technological Developments: Science fiction inspired all these changes like AR and VR technologies. The greatest fictions have led marvelous discoveries in the field. It is one of the greatest examples as things that were considered imagination in the last century, have been materialized. Certainly, there are many examples that can be given here that are positive and negative in nature. But the fact remains that Media plays a very crucial role in creating a path to inventing futures- by creating these self-fulfilling prophecies. As long as it can be believed in and imagined, it can be materialized though actions. Rosamond, Ben. “Review of Inventing the Future: Postcapitalism and a World without Work by Nick Srnicek and Alex Williams.” New Zealand Sociology 31.6 (2016): 134-42. ProQuest. 20 Dec. 2018 . Dunne, Anthony, and Fiona Raby. Speculative Everything: Design, Fiction, and Social Dreaming, MIT Press, 2013.